Doug and I recently caught up with David Scott Barron for an exclusive interview for his podcast – “The Naked Truth” – check it out! 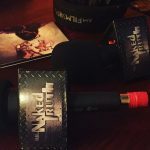 The Naked Truth with Dave Barron rock podcast is back with a twist for season three in 2017! For the first-time ever, the series will be released uncensored! All the music, all the interviews, untouched! “I want the truth, and sometimes artists are reluctant to speak honestly about the music business for fear of getting branded,” Barron says. “By striving for the truth in music, I can get to the bottom of how artists make it happen in 2017. That’s what I want to showcase. I want music fans to hear The Naked Truth. Consumers want something, and we are supplying the demand.” He continues, “Instead, The Naked Truth, I think, will become it’s own platform, and will launch new programming that follows that trend. Giving the people what they want, Hence, hashtag- the #INDIEASAMUTHERFUCKER’’ said Barron. The 2017 premiere episode features the unsung heroes of the 59th Grammys and independent rock bands in Los Angeles. Dave Barron hosts the show recorded live at Mel’s Diner, the legendary 1950’s diner in Hollywood. Dave will feature new music from Megadeth, Enemy Remains, Metallica, Iggy Pop, Joe Bonamassa and Soen. Barron conducts live interviews with independent rock bands Mad Margritt, MotorBone and Lucid Fly. In addition, a feature segment from a sit-down interview with Jesse Snider is featured involving his current indie LP, 16. The Naked Truth also got a makeover, with new show music and a new MC. Announcer Mike Noble is the new voice of The Naked Truth, replacing Alan Jay. “Mike Noble is The Naked Truth, He was there when it was a cable access TV show. I love Mike’s voice and he seems like a perfect fit moving forward,” said Barron. As for the music, Mark Cook from Mad Margritt recorded tracks for The Naked Truth in his studio, The Panic Room. “Mark Cook is a phenomenal guitar player. Anytime Butch Walker recommends you, you know you have arrived,’’ Barron commented. Mike Noble has been a professional announcer since 1994, when he was the public address announcer for the NBA’s Atlanta Hawks. From there he did freelance work for the NFL’s Atlanta Falcons, and became a familiar voice in Atlanta’s arenas and stadiums. In 1996, Noble was selected to be the arena voice for team handball in the Summer Olympic Games in Atlanta, and has been a part of every Olympics since. Mike’s clean, professional voice will add some punch to the radical rock podcast. Cameo appearances in this edition of The Naked Truth Vault include David Ellefson, Ronnie James Dio, Chris Cornell, Jeff Ament, Mark McGrath, Dee Snider, and Liberty Devitto. Shoutouts recorded were to Smith’s Olde Bar, Gene Scott, Josh Homme, MAL, Kris Jung, PJ Hollywood, Forrester Savell, FireFly, The ViperRoom, Mel’s Diner, and Adrenaline PR. The Naked Truth began as a cult cable access program in Atlanta, GA in 1990. For three years, the show went above and beyond where any TV show would venture. It has always been off the cuff, unfiltered truth. More than two decades later, the marriage with indie music is as strong as ever. The home of independent music, The Naked Truth with Dave Barron.